When you get a new rifle or in case you simply have to replace your old rifle scope it’s becoming quite challenging to evaluate the different scope options you have. You can look around in the different stores and outdoors shops but you usually only find a limited selection of hunting optics. A great way to finding the best rifle scope for a great price is to look online. Check out some reviews that guide you in finding the scope for your needs. Pricing online is usually more economical than in brick-and-mortar stores and you can find reasonably priced scopes that offer excellent capabilities online. Our site strives to provide you with in-depth reviews on rifle scopes. You will find background information on manufacturers and on anything related to hunting optics. You will find out that there certainly are some extremely good rifle scopes available on the site. Check the reviews to find the best rifle scope for your gun at the best price. A good quality rifle scope does not have to cost a lot while still offering excellent value. Decide on a budget for your scope. Just like any major purchase, your choices range from cheap to very expensive. Though it is clear that your budget does depend on your financial situation. However, the single biggest mistake that you can make – along with many other hunters and shooters – is to under spend on your rifle scope. The advice you’ll get from many serious hunters is that you should spend as much on your scope as you do on your rifle. Now, this might not be practical or affordable but make sure you budget a reasonable amount for your next rifle scope. Pick the right objective size for your shooting style. The rule of thumb is that the larger the objective, the more light is gathered which results in a brighter sight picture. The trade off though is the larger size of the scope. You have to pick a rifle scope that is not too big for your rifle setup while letting enough light in to produce a bright sight picture. This next point is probably not the highest selection criteria on any hunter’s list. It’s more of a style question and our suggestion would be that you match the finish of the scope to the finish of our gun. Most scopes are available in a range of different finishes. Usually you can get matte, camo, gloss, or silver finishes. Again, this is not the biggest issue but you might want to somewhat have things match. If your rifle for example has a blued barrel then you might want to go with a matte finish. Silver might look a little out of place in that case. Decide on the best reticle. You will find that nowadays there’s a large amount of choices when it comes to cross-hairs or reticles. Your major decision is to usually either to with a standard duplex style or a mil-dot style reticle. A duplex reticle is where the cross-hairs are thick on the edge and then step down to a finder reticle in the center of the target. A mil-dot style reticle has hold over marks below the intersection of the cross-hairs. These marks are used as aiming points on distant targets. Probably the most important choice you have to make is the magnification of the scope. You want to match that to your hunting or shooting style. A large magnification usually results in a smaller field of view so only pick a large magnification if you really want to do long distance shots. If you usually shoot at closer ranges then use a scope with a lower magnification. Most rifle scopes today come with variable ranges of magnification and the most often used ones range from 3 to 9 x. These scopes have shown to be usually a good fit for most hunters and shooters. In many cases more expensive doesn’t automatically result in a better quality scope. You can often find good scopes and possibly the best scope for your shooting style for less money than you think. Check out our reviews and also specifically the feedback from other customers on specific rifle scopes. Don’t simply take our word but check on what others have to say about a specific scope. Research our reviews as well as customer feedback so you get the best rifle scope. What is more important? The rifle or the scope? One thing to keep in mind is that when you buy a rifle scope you should match the quality of the scopes you consider to the quality of the rifle. 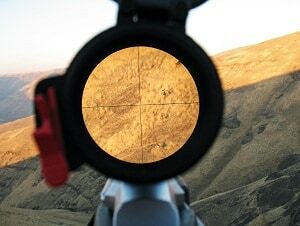 A rifle scope helps you aim the rifle but the overall shooting accuracy depends mainly on the rifle itself.